Do you know what the most powerful thing about digital marketing is? The fact that you can monitor and measure every single step of your marketing process. And the best way to do so is to create a digital marketing funnel. If you are familiar with a traditional marketing funnel, you’d have no problems working with a digital marketing funnel. Like the former, a digital marketing funnel helps you to analyse how well your customer conversion process is performing. From awareness to perception to engagement to conversion to advocacy. Here’s how such a funnel could possibly look like, complete with various content types that may work. Using tools like Google Analytics or marketing automation software like Marketo, HubSpot, and Infusionsoft, it is possible to continually streamline and optimize your digital marketing process. Let us take a closer look at how this entire process works. A digital marketing funnel (or sales funnel or marketing funnel) captures the different points of entry of your target audience to a web page or social media post. Also known as TOFU (Asians will have no problems remembering this! 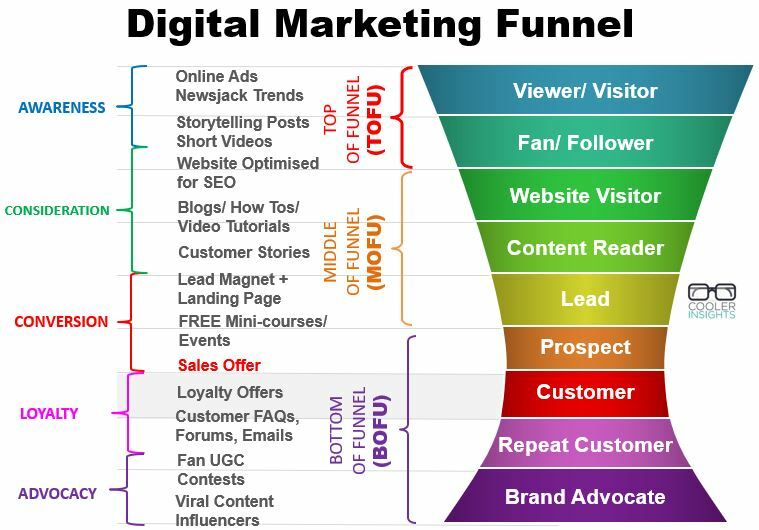 ), the top of your digital marketing funnel is where the bulk of your visitors first encounter your online brand. Search Engine Optimization (SEO) – They searched for specific terms or keywords which your website ranked for, and clicked on the link provided by a search engine. Social Media Marketing (SMM) – They were attracted by a social media post (eg Facebook, LinkedIn, Twitter, etc), and clicked on the link shared. Pay Per Click (PPC) Advertising – They clicked on an online advertisement on Google’s network (AdWords or Display Ads), a Facebook Ad (eg sponsored post), or other social media/online ads. The key here is to attract the most relevant and interested parties to visit your website or landing page. To do so, generate and share short but helpful content such as blog articles, infographics, and slides which address specific customer pain points or needs. Note that we normally do not ask for the sale at this stage. This is because your TOFU web visitors are likely to be fairly “cold” to your products or services. However, you can introduce specific Calls To Actions (CTAs) to convert TOFU visitors to MOFU leads. This may include encouraging them to opt-in with their contact information for more valuable and helpful content like an eBook, slide, or template. Unlike TOFU visitors, folks who hover around the MOFU layer are normally more invested in their relationship with you. Often, they are the more valuable leads who have decided to opt-in by providing their contact details (normally name, email address, organisations and occasionally mobile numbers) on what we call a lead page. eBooks – These are the gold standard for MOFU content for professional services like management consultancy, IT, or financial services. Tools and Templates – Everybody loves a downloadable “plug-and-play” template which they can use for their business. Tools like calculators or auto-updated spreadsheets are also valuable. Webinars or Seminars – Learning opportunities like these not only provide immense value to your leads – they also allow you to promote and sell your products or services. White Papers – These are more theoretical and academic than eBooks, and normally include some research findings. Videos – Normally instructional in nature, opt-in videos could be offered as a “free sample” of a full course which you offer, or provide a valuable “DIY” tip to your users. At this stage, you are looking at building a strong community who opt to subscribe to your email newsletter and receive updates from you. After they have been “warmed up” sufficiently as a beneficiary of your content marketing efforts, you may want to convert them to become actual customers. Which brings us to the next stage of lead nurturing – BOFU. The Bottom Of Funnel (BOFU) is where the rubber meets the road. After you have attracted a strong following of leads and prospects who follow you religiously, you need to find the opportunity to convert them to become customers. This is where email marketing or perhaps remarketing or retargeting of your prospects could come in. Often, an attractive offer which is highly targeted and relevant hits the sweet spot – the “Buy Now” button on your email, lead page or website. What strategies can you apply to convert your leads to customers? Free trials – These are popular with providers of online software (aka Software As A Service or SAAS). The usual duration is a 30-day free trial, where you “hook” your user in populating his or her content on your platform. Once the trial period is up, a credit card account would be needed to pay for continued use of the service. Online assessments – Free diagnostic tools like website audits or psychological tests help to draw your customers in by offering them real value for free. However, the next steps (ie engaging your services to rectify the faults detected in the assessment) are usually paid. Discount coupons – Everybody loves a good deal. Timed to create a sense of scarcity, these deals normally offer a significant discount to make it attractive for users to buy. One-to-one consultations – For higher priced services or products (eg legal services or purchasing a car), a face-to-face consultation or actual physical test-driving helps to move a prospect to buy. Note that getting your leads and prospects to become your customers alone isn’t enough. Expert marketers know that managing customer experience is critical to long-term digital marketing success. Adopting a holistic view of your customer helps you to improve customer loyalty and lifetime value, giving you permission to upsell products and services to them. Beyond this, you may also want to encourage your best customers to become your Word Of Mouth (WOM) advocates, especially on social media. You can start by giving them a small incentive (eg discounts off purchases) to involving them in designing your product. Read 9 Ways to Build Relationships on Social Media to further learn how you can socialise your digital marketing efforts. Learned to attract your target audiences, turn them into leads, and convert them to customers and advocates? Good! Now you need to track, measure and optimize your digital marketing performance throughout your marketing funnel. This is where digital marketing analytics using tools like Google Analytics comes in. 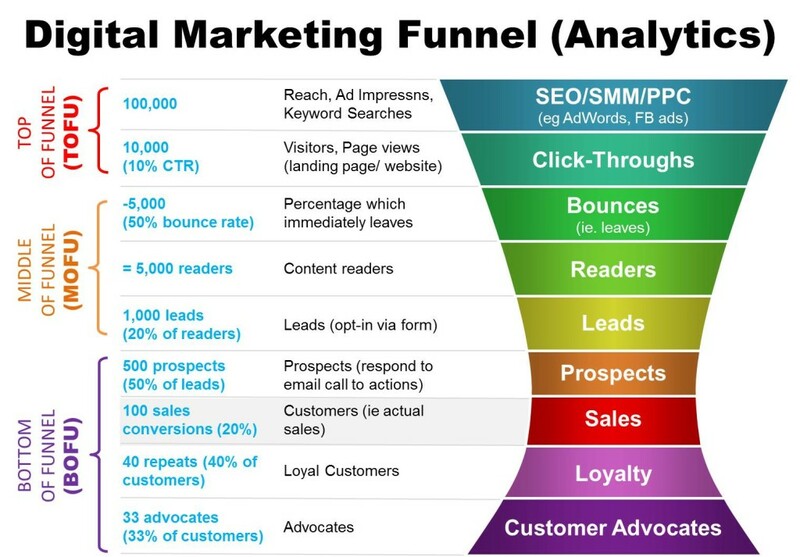 Let’s revisit our digital marketing funnel and add a layer of metrics and analytics. For the example above, you can see that different measurements are needed for audiences at different stages of engagement with your brand. Awareness and reach: social media reach, ad impressions (usually measured in thousands of views), and keyword searches. Visitorship and views (either on your website, landing page, or social media page). Normally, the numbers who “bounce” off your website (ie leave after viewing only one page) is an indication of how “sticky” your content is. The lower the bounce rate, the higher your chances to converting your visitors to become readers. Content readers: web visitors who spend a longer time on your website (eg 2 minutes or longer). This can be easily tracked with Google Analytics or other analytics software. Leads: those who choose to opt-in via a form. Prospects: the folks who not only subscribed to your email newsletters, but clicked through on an offer. Customers: leads or prospects who actually responded to your offer by completing the purchase process. Repeat Customers: customers who make two or more purchases of your product or service. Advocates: customers – and sometimes non-customers but fans – who helped to spread your content on their own social networks. From the example given above, you can see that a reach of say 100,000 impressions yielded 100 sales conversions (ie 0.1%). While this number may appear small, you need to consider the value of your product. 100 sales of a $1,000 high-end software product equates to $100,000 in revenue! All of these improvements will help to increase the ROI of your digital marketing efforts. Now that you have learned about the different levels of your digital marketing funnel, your next step involves setting it up. A good tool to do so would be Google Analytics. 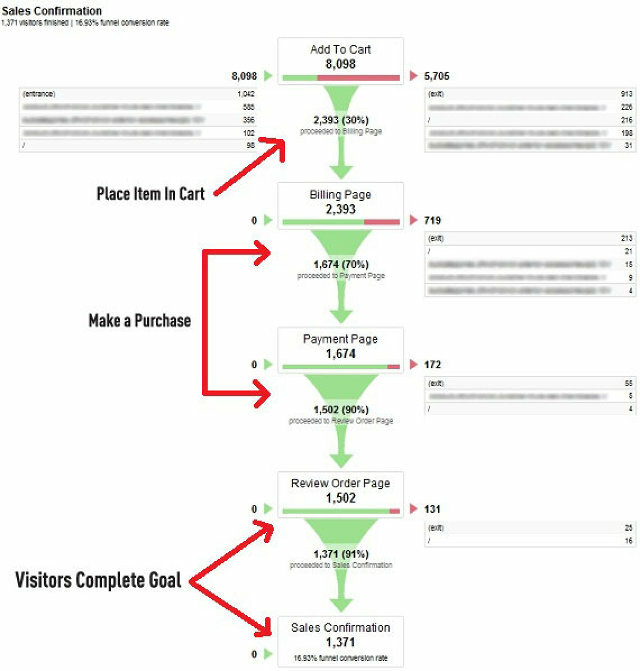 This free tool allows you to establish conversion goals for each stage of your funnel and track your customer “flow” from one level to another. Ready to Have Fun with Funnels? 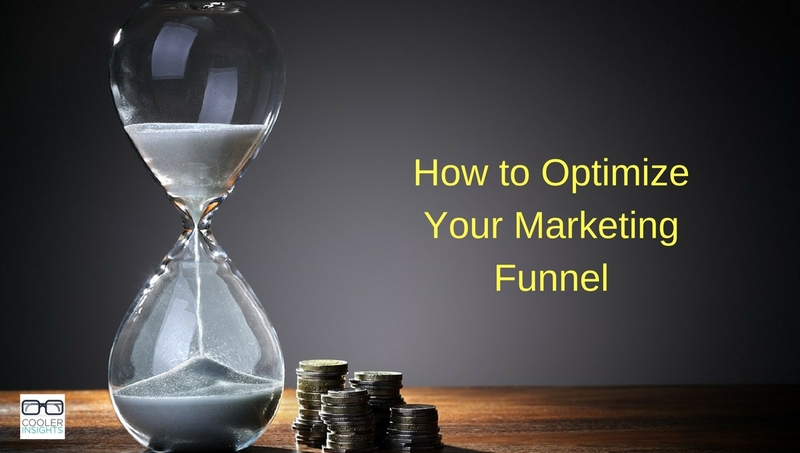 Hope that my brief guide above gave you a basic understanding of how you can use digital marketing funnels to define, measure and optimize your digital marketing funnels. Naturally, this isn’t the only way to look at funnels – there are hundreds of different variations. However, the key principles of funnel analysis remains the same. What I’ve covered above are just the tip of the digital marketing iceberg. Learn my 6-step process for social media marketing campaigns in a rigorous two-day training course and master all the steps needed to bring your social media campaigns to life. 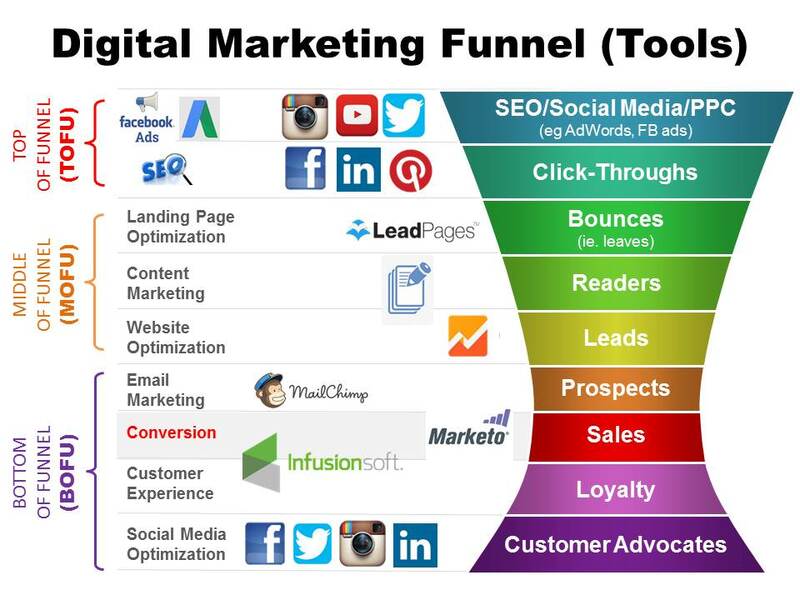 Could you list all the Digital Marketing Tools and from the diagram?